Net migration could fall by about 100,000 a year if the UK leaves the EU and introduces work permits for EU citizens, a pressure group has said. Migration Watch says this would cut net migration - the difference between the number of people arriving and leaving - from 180,000 to 65,000 a year. But James McGrory, from the pro-EU Britain Stronger In Europe campaign, called the report "disingenuous". He said it was "another example of fudging the facts". The UK is set to have a referendum by the end of 2017 on whether or not it should remain a member of the European Union. The report from Migration Watch, which advocates tighter immigration controls, looks at possible policies that could be introduced if the UK voted to leave the EU and considers their impact on overall migration figures. No-one knows for sure what impact a British exit from the EU would have on immigration. It would depend on the terms of a new settlement that might take months to negotiate and years to put into place. But say, as Migration Watch advocates, that it did herald controls on the flow of low-skilled EU migrant labour, would that really work in reducing net migration? Wouldn't there be an influx of migrants from the EU before the restrictions came into force? Wouldn't businesses that currently rely on labourers, chambermaids and supermarket shelf-stackers from Europe demand that they be allowed to recruit them from elsewhere? And wouldn't the EU introduce work permits for British workers, thereby reducing emigration from the UK? These are questions that need answers in the months leading up to the referendum. The report suggested the key change could be the introduction of work permits which would limit EU nationals entering the country to higher-skilled workers, their family members and students, while low-skilled workers would not be granted entry. Lord Green of Deddington, chairman of Migration Watch, said: "It is time to examine possible alternative immigration regimes." Under the current arrangements, signs indicated migration to Britain would "continue at a substantial rate for the foreseeable future", he said. "Indeed, immigrants tend to generate further migration as their friends and relatives join them in their new countries," he said. "Work permits for EU citizens would substantially reduce net migration and its resultant pressure on our population and public services." The 16-page paper suggests that on average only about 20% of EU migrants who came to Britain between 2004 and 2014 were doing higher-skilled work. It said: "This could substantially reduce the EU inflow for work to perhaps one fifth of its recent level and would, in turn, substantially reduce net migration by perhaps 100,000 a year from the current level of 180,000." The figures should not be taken as a "precise estimate" but were "intended to illustrate the scale of the potential reduction under the policy outlined", it said. There would be no need for restrictions on EU citizens coming to the UK as students or tourists, the authors concluded. Those who are "self-sufficient" would also be free to live in Britain, including those who are looking for jobs. Under the suggested system there would also be no restriction on EU family members of British citizens coming to join them, while relatives of European skilled workers and students would have the right to live and work in the UK. 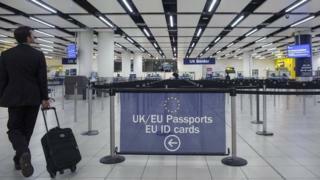 Those EU citizens already living and working in the UK would retain their existing rights, Migration Watch suggested. However, pro-EU campaigner Mr McGrory said: "Right now, Britain has the best of both worlds. We have an opt-out from the passport-free Schengen area, while still enjoying full access to the single market. "The Leave campaigns haven't produced a shred of evidence to show how they could guarantee a deal that is at least as good if we left." The Migration Observatory at the University of Oxford said if it became harder for employers to recruit EU workers they may try to bring in more migrants from outside Europe. Most recent estimated net migration to the UK reached a record 336,000 in the year to June 2015 according to Office for National Statistics (ONS) figures.